Another Novel Read: Once again I've had the honor of reviewing a book written by an author whose works captured my imagination and I'm sure will capture yours. Today we’re celebrating the release of BRAZEN by Christina Farley! 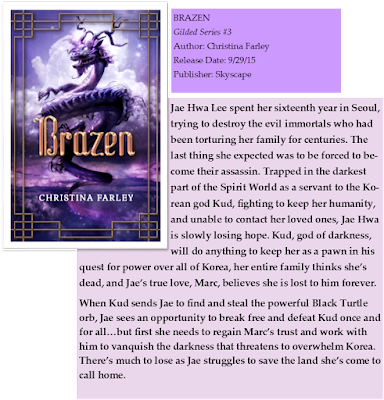 BRAZEN is the third and final book in the Gilded series about a sixteen-year old girl who must use her martial art skills and wits to save her family, friends, and country from an evil Korean god. I met Christina Farley during LIBCON in Orlando's Central Library this past year and was intrigued by the premise of her series so, being an avid reader, I just 'had' to buy it. I wasn't disappointed. Unfortunately, I made the mistake of not buying the second one so I bought it later that day for kindle and by the end of the weekend (span of two days folks) I was jonesing for the third installment, this installment, Brazen. I was one of the privileged few who received an ARC in exchange for an honest review which I am more than happy to give. In the words of the little neighbor child in Disney's The Incredibles, "That was totally wicked!!" Yep, there it is, my review. No really, Ms. Farley has created in Jae not just a character, but a person, with all their doubts, frailties, and strengths. The decisions are real even as she tries desperately to resolve the myth that she is an integral part of and restore peace. Jae, like the reader, has experienced joy and loss and she takes you with her through her journey. You discover truths as she does and boy does it take you through the ringer. Trust, betrayal, hope, fear, love, all are present in this book. With some series, there is a disconnect in continuity from one book to another but there is no such thing here. If you've read Silvern, the second in the series, you have an idea of where it will pick up but it will still surprise you in a pleasant way. This is one book you definitely want to pick up, but here's a tip, reader to reader. You can read it as a stand alone, but as soon as you start, you're going to go "what?" "Why did that just happen?" Save yourself the trouble. Buy Brazen, but get Gilded and Silvern too, you won't regret it. CHRISTINA FARLEY is the author of the Gilded series, a YA contemporary fantasy series set in Korea. GILDED was nominated for Korea's 2014 Morning Calm, Ohio's 2015 Buckeye award, and the Tome’s It List. As a child, she loved to explore, which later inspired her to jump on a plane and travel the world. Christina's adventures sparked her to write stories, infusing the real world with fantasy. Currently she writes from home in Clermont, FL with her husband and two sons—that is until the travel itch whisks her off to a new unknown. To celebrate the release of BRAZEN, Christina is giving away a Kindle Fire (US only) and a $50 Amazon gift card (international). The letter for this stop is _R__. Collect all the letters from the blog tour to earn more points! Thank you so much for being a part of my blog tour!